Set up a SSH connection to pedagogue.physics.ox.ac.uk. In the tunnels section, create a local forwarded port with local port 3389 and destination heisenberg.physics.ox.ac.uk:3389. For more instructions on how to do this, see my SSH instructions. Once this is done, click Connect and login using your OS X user name and password. Next, go to Start, Programs, Accessories, Communications and click Remote Desktop Connection. If this is not listed, install it from here. Enter "localhost" as the computer name, and click the "Options >>" button to expand the window. 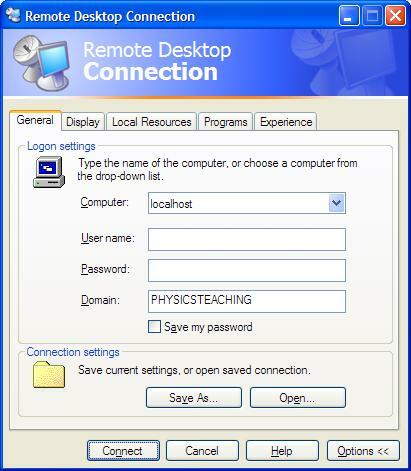 Enter your Windows username and password, and the domain "PHYSICSTEACHING". Use the "Display" tab to set the display size (anything up to full screen). The "Local Resources" tab allows you to set options for disk and printer sharing if you want. The "Experience" tab is also useful for speeding up your connection by disabling grapics and animations. Once you are happy with the settings, click Connect, and when the Windows login screen appears, re-enter your Windows username, password and domain as before. That is all there is to it. Note that if the server does not have printer drivers for your printer, the printer sharing will not occur. to open the tunnel, there is a remote desktop client available for Mac here. Linux users can use rdesktop. Within the physics department, the tunnel is unnecessary; you can simply enter heisenberg.physics.ox.ac.uk as the remote desktop computer name.